a Princeton University math major who has also been studying clowning. Here’s a story from Princeton about a double major in math and theatre that is creating a one-man clown show. Or as he prefers to say a one-man show about a clown that is not a clown show . After graduation, he goes back to work for Pig Iron. I’ve known a number of math/science/geek guys that have ended up as clowns. (I guess I’m kind of one of them– I was captain of the math team in high school, and our team won the state championships all three years I was involved!) And one of the circuses that I was intimately involved with was produced by a guy from Swarthmore, and featured a cast that was mostly Ivy League grads, including Penn, Dartmouth, Brown, Harvard, and some other places like MIT, RISD, and Stanford. Most of the math guys who are clowns I know enter through the juggling or magic world. If you are a math/science/nerd clown guy, tell us about it in the comments! Senior Sam Zetumer likes to work in opposing realms. He is a math major who is earning a certificate in theater and dance. 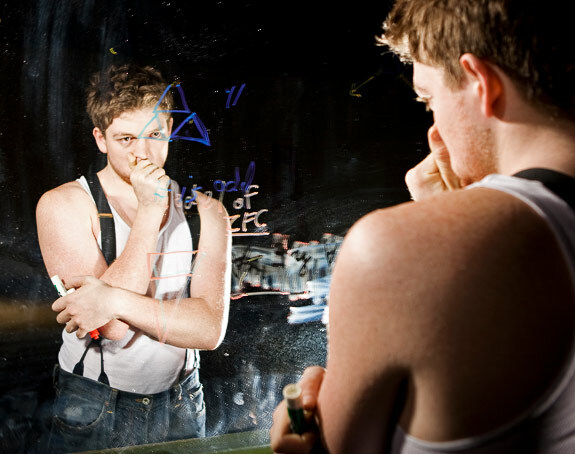 He scribbles math equations on the chalkboard while waiting for rehearsals to begin. He currently is completing two senior theses: one on set theory, and one on clowning. Zetumer enjoys immersing himself in two such different disciplines. Math requires him to “shut down external awareness,” he said, while theater asks “that I exist in this communal space.” Alternating from one to the other is “like going 60 and then going in reverse,” he explained. Beginning Friday, April 24, Zetumer will perform his senior thesis production, titled “Good Winks Here,” a one-man show about a clown that is not a clown show — no juggling and no gags. Vasen sees a common thread in Zetumer’s twin pursuits. Zetumer studied physical comedy last summer when he took courses on clowning technique offered by the Pig Iron Theatre Company in Philadelphia. The company describes itself as a dance-clown-theater ensemble that seeks to break the boundaries of dance, drama, clowning, puppetry, music and text. 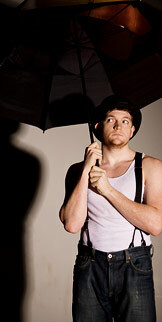 His summer with the troupe was supported by the Lewis Center’s Alex Adam ’07 Award, which Zetumer won last year. The award funds summer projects that lead to the creation of an original work of art. Zetumer first worked with members of Pig Iron during his freshman year, when they taught a physical theater class at Princeton that included clowning. After graduation Zetumer will move to Philadelphia to work for Pig Iron as an assistant stage manager. A native of San Diego, Zetumer was drawn to Princeton because of the University’s strengths in math and theater. For his other thesis, Zetumer is constructing a new version of set theory, which is an important foundational system for mathematics. During his time at Princeton, Zetumer has appeared in several theatrical productions, portraying Prince Shuisky in Alexander Pushkin’s play “Boris Godunov” and performing in “The Winter’s Tale,” “All My Sons” and “Romeo and Juliet.” But for Zetumer, “Good Winks Here” promises to be his most memorable role. I'm very interested to know more. The article doesn't really tell me anything in detail about the connection between maths and clown. As a clown and a clown researcher, who many years ago used to love maths, I'm intrigued but not yet enlightened.